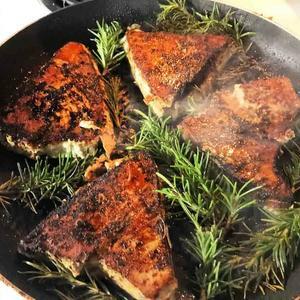 Easy blackened Thai chili tuna Steaks are way easier than I thought they would be. I thought blackened sounded technical when I first heard it until I tried it and realized it's easy. You can buy tuna steaks for like $5 at somewhere like Aldi. You take them out of the package and rinse them, rub in the powder, blacken them on each side and roast them in the oven for 5 minutes.